We left Villarrica to clear blue skies, but as we drove along the Panamericana the skies got blacker and the rain started with a vengeance. The drive was not too scenic along the fast main road, which was fine as we were keen on getting to Puerto Montt. By the time we arrived we dreaded opening the back of the landy in case we were greeted by more water. Luckily it had survived ok and everything inside was dry..
After checking into our hotel - Hostal Pacifíco - we headed out into town for a bite to eat - some beers in the local beer hall and a huge plate of chips, olives, cheese and sausage. Not quite a Chilean delicacy but filling none the less! A quick walk around town to get our bearings and then back to the hotel for a kip..
Puerto Montt is the gateway to the southern lakes and Chilean Patagonia. 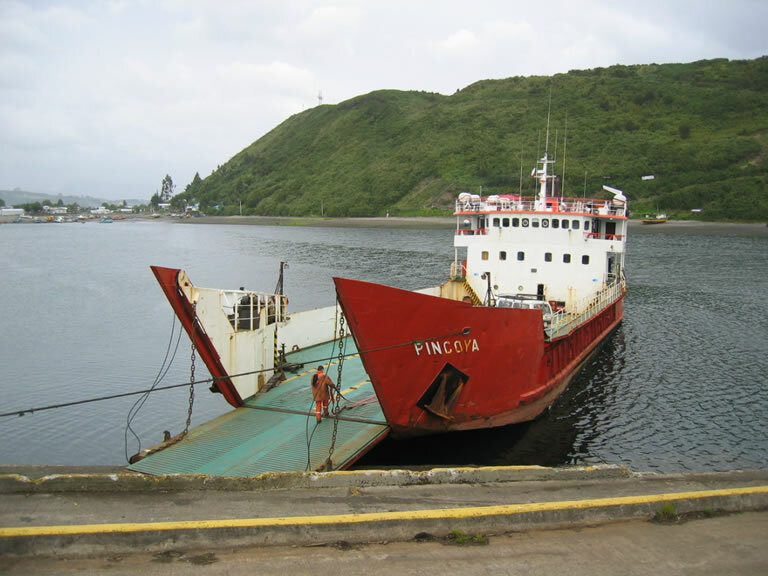 It is from here that many people catch the scenic - and expensive - Navimag ferry south to Puerto Natales. It is also the beginning of the Carretera Austral, which was one of Pinochet's projects to link the various southern territories of Chile together. It took over 10 years to build and consists of a single track gravel road that extends for 1200km, finishing in Villa O'Higgins. We were planning on taking this route and headed into town the next day to get some information on the ferries that join various sections along the way.. The town seemed like a ghost town, with offices all shut up and only a few shops open. It wasn't long before we realised 8th December was a national holiday so it looked as if we wouldn't get much done. Luckily we found an internet cafe open in the big mall and took the opportunity to catch up on emails and research ferry times etc on the net. By lunchtime more shops were open and the town was full of families out Christmas shopping. That evening we grabbed a taxi and headed out to Angelmó on the edge of town. It is supposed to be good for fresh fish dishes, but being a national holiday, not many restaurants were open and we went into the first one we saw that had some people in it. 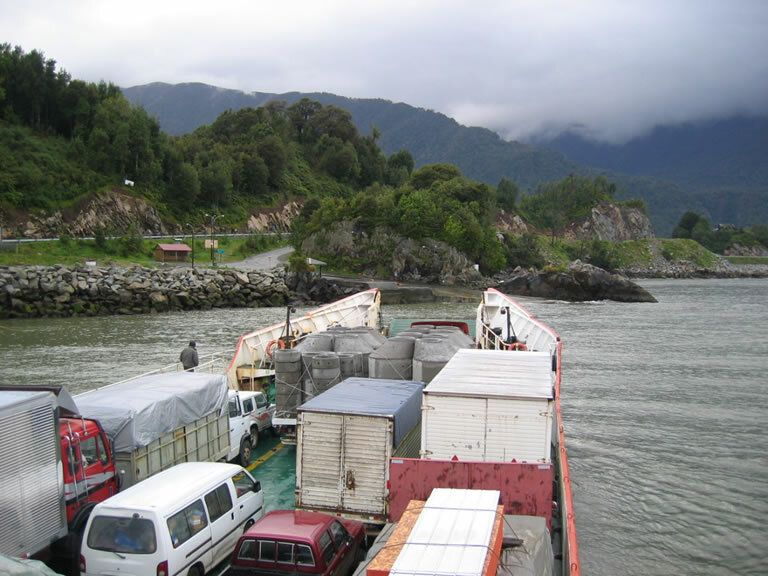 There was a ferry running to Chaitén that night at 8pm with Transmarchilay (www.tmc.cl). It cost 58,000 Chilean Pesos for the car, 2,000 Pesos for the driver and 10,000 for each additional passenger (approximately £70 in total). Not too bad for a 10 hour crossing! After driving the landy onto the ferry and leaving it in the open air, exposed to the elements, we made our way inside to find our assigned reclining seats for the night. Even though everyone had numbered seat tickets, it was pretty much a free-for-all so we just sat where we could and headed out on deck to watch the departure. It was a pretty noisy night and there wasn't much chance of getting a good night's sleep. We met an English couple travelling through Chile and Argentina and they were probably the noisiest of the bunch. In the middle of the night the girl started screaming and shouting like a mad woman, and her boyfriend had to try to carry her outside to calm her down. He literally had to drag her out as she was too drunk to walk. A really good advert for Brits! We were pretty glad to be getting off the ferry and away from civilisation the next morning. 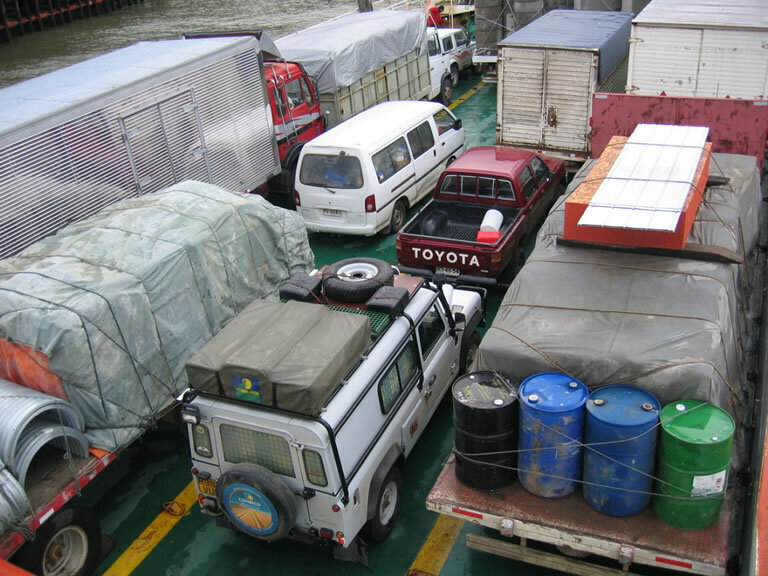 It wasn't long before we were on the Carretera Austral and virtually alone.